BRUSSELS/SAN FRANCISCO (Reuters) - Alphabet Inc's Google on Tuesday revamped how it distributes its mobile apps in the European Union, introducing a licensing fee for device makers to access its app marketplace in a response to regulators' findings that it had broken antitrust law. The new arrangement opens doors for Google's web search and browser rivals such as Microsoft Corp but essentially leaves the U.S. tech giant's lucrative mobile business intact, analysts said. 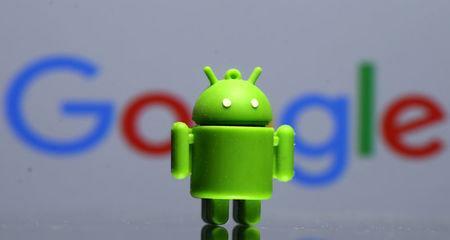 The European Commission in July fined Google a record 4.34 billion euro ($5 billion) for using the market dominance of its mobile software to hinder rivals in areas such as internet search. Samsung Electronics Co , Huawei Technologies Co[HWT.UL] and other device makers will have to pay Google an undisclosed amount for access to the Google Play app store. In exchange, the hardware companies no longer have to install Google search and the Google Chrome browser, though they can do so for free if they want to. Shares of Alphabet closed up 2.9 percent on Tuesday.